The size of Siberia is 9,734 thousand square km. This is 57% of the whole of Russia. By its surface areaSiberia is only comparable with Canada, which is the second largest country in the world. Continues our list of facts about Siberia — the only of its kind freshwater sea. In Siberia there is a unique Lake Baikal. The size of ​​Lake Baikal is about equal to the square area of the Netherlands. It is the deepest freshwater lake in the world. It is also the oldest lake in the world. And it is the cleanest lake in the world. Only one river flows from the lake – the Angara River. The water in Lake Baikal is very clear — up to 50 m. Approximately 20% of the world’s fresh water is the water of Lake Baikal. In the Lake Baikal area each year more than 2000 earthquakes take place. At the lake most of the time there is sunny weather. Tunguska meteorite fell in Siberia. At the site of the Tunguska meteorite no crater was found. There were found no fragments of a meteorite either. To this day there no consensuswhat exactly was the Tunguska meteorite. Great Vasyugan swamp is the largest swamp system in the northern hemisphere of the planet –it is located in the heart of the West Siberian Plain and it is a geographical phenomenon in the sense of an unusually wide distribution of swamps. It stretches from west to east for 550 km, and from north to south for 270 km. The square area of the Great Vasyugan swamp is more than 55 thousand sq. km (for comparison, the square area of Switzerland is only 41 thousand sq. km.). Great Vasyugan swamp in Siberia is a natural phenomenon that has no analogues in the world. It also contains the largest reserves of peat. Permafrost means that the land is never thawed. About 65% of Russian territory is occupied by permafrost, and most of it is located in Siberia. Permafrost is located in Siberia in the northern part of Western Siberia (about until the latitude of the Ob River) and in the greater part of East Siberia, Trans-Baikal. Negative temperatures penetrate the earth’s crust to a depth of up to 1300-1500 m; their minimal average values ​​reach -15 …- 16 degrees Celsius / 5…3 degrees Fahrenheit. 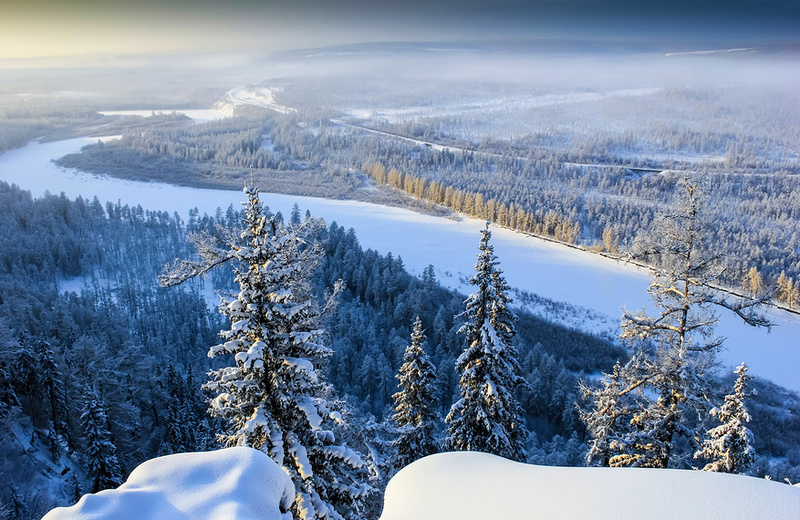 The next phenomenon is a worrying sign in the list of facts about Siberia. Climate warming reduces the size of the permafrost in Siberia. Inside permafrost there is the strongest greenhouse gas — methane. Thawing of the permafrost will release the gas and accelerate warming – thus, a self-accelerating process will start. This can have catastrophic consequences for the whole of humanity — from all kinds of disasters anywhere from a third to half of all mankind may die. Four Siberian rivers are on the list of top 10 world’s largest rivers — Ob, Lena, Amur and Yenisei. One of the most popular dog breeds – Siberian husky. This breed comes from the breed of dogs that are bred by the natives of the Russian North. In Siberia was found a site of the ancient people from Paleolithic Karama. They lived in these places in the period of 1,000,000 – 800,000 years ago. In that time Siberia had a favorable climate. Genetic analysis showed that the Asian species Homo erectus could reliably be an ancestor of a modern man. Our list of facts about Siberia is continued with a message from scientists. In 2008, in Denisov cave in Siberia scientists found a phalanx from which it was possible to isolate a DNA. DNA analysis showed that the finger belonged to a girl. And the girl herself belongs to a new (!) species of humans – Denisov humans – which is different from the Neanderthals and modern humans. Leaders of the international trade union movementwere delighted with the establishment of the first socialist state in 1917, and they negotiated with Soviet Russia allocating industrial facilities and space for the colony. Finally all the formalities were settled, people were found, and in 1921 in Kemerovo (Siberia) was established an international colony. In 1922first colonists arrived to Kemerovo. In total about 750 people of 23 nationalities came to Kemerovo. Initially, the working language in the colony was English, and then — Russian. In the zone of interests of the colony there were: Kemerovo mine, a cable car across the Tom River, unfinished coke-chemical plant, the railway station Kemerovo and 6 more mines. A power plant was built, and extensive training began, a very advanced farm was created, a coke-chemical plant was opened and 2 telephone stations were established. Look at the dynamics of Kemerovo. Construction of houses in Kemerovo: 1926 – 200, 1927 – 800. Kemerovo population: 1917 – 3,900, 1926 – 21,700. Efforts of the colony were directed at improving the organization of labor, increasing self-interest, developing the technical level of production. A renowned Dutch architect Van Lochem worked as an engineer-architect in Kemerovo. However, the romance of the international colony was not supported by the Soviet government. Always wanted to ride the trans-Siberian R.R! I just watched the film «Happy People — A Year in the Taiga» about life on the Yenisei River around Bakhta. This is a real eye-opener about a place I know little about, and shows just how self-reliant the people are, even at -50 C. Highly recommended! Yes, I watched all episodes of the film «Happy People». This is a special film. I did not know that the film is available in English. One of the most popular dig breeds – Siberian husky. This breed comes from the breed of dogs that are bred by the natives of the Russian North. very useful information but i think it should be ‘dog breed’ not ‘dig breed’ in first line of the paragraph. How to connecti with people for World Cup 2018? I am fascinated by the people and climate of Eastern Siberia. I had an oppertunity to travel with a E.Siberean lady Antilope Canyon at Las Vegas USA . Great lady impressed a lot and with out english she managed the whole tour. How can the tourists,enjoy the scenic views of Russia,I mean to ask the modes of transport available for them,so that they can roam around Lake Baikal,St Petersberg,Moscow etc ?